A dark whoosh coming from the abyss opens the first seconds of "Wide Open Range". Keyboard chords stroll in background there, weaving the strands of a ghost melody which will faint as "Wide Open Range" sells its 11 minutes. A line of sequences invites itself. Its circular movement make clink its keys which skip in an ascending movement, while the waves of synth are painting a sinister atmosphere. It's the dance of the sequences. Frivolous and undisciplined, they flutter in jerks by tying its fragile ethereal pace onto the strikings of percussions. Gradually the music gets intensified. The rhythm becomes heavy but stays slow. The percussions are equal to a skillful drummer in a progressive rock band. The guitar riffs bury the dance of the sequences of which the delicately spasmodic ballet is dancing lightly in solo in the banks of silvered mist at around the 4th minute. The structure of "Wide Open Range" sees again then its introduction and makes adjustment with another line of bass sequences which gallops with more vigor, trying to avoid the bites of the elytrons of metal from the cymbals. The rhythm becomes then very electronic with these lines of sequences which mix their charms with lines of synth delicately perfumed by psychedelism. But no solos! The percussions become heavier. The riffs get more present. And "Wide Open Range" explodes for a big progressive electronic rock at around the 6th minute. A short moment of fury where the synths swap their effects for guitar riffs and where Max Schiefele takes the lead with loud solos. The chaos becomes harmony with two layers of guitar, one acoustic and the other one electric, where bluesy solos cry over on acoustic notes. Little by little the sequences are taking their rights on a more electronic mood, entailing the finale of "Wide Open Range" towards a lunar electronic setting. Nervous and hopping sequences, cosmic banks of mist, electronic effects on good structures of rhythms sometimes short-lived and sometimes sustained, catchy melodies; “Distance” is not an album of Pyramid Peak and nor an album of Axess. Certainly the name and the approaches are rather similar, in particular at the level of the structures of rhythms, but the synths here are discreet and leave all the room to Max Schiefele's six-strings, so giving more the illusion than this first opus of Pyramaxx is an album of Maxxess which is solidly supported by a very effective Pyramid Peak but amputated of Uwe Denzer. Max Schiefele (Maxxess) and Axel Stupplich! It's a long story which goes back up in 2004 with the solo album of Axess (Axel Stupplich), Contact. Since then both friends worked together on many times, Max Schiefele accompanying even Pyramid Peak for several concerts during the last years. It was inevitable that sooner or later this collaboration was going to find its reason on an album. 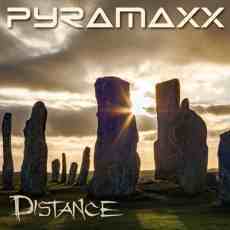 And “Distance” is a good album of EM where the signatures of Pyramid Peak and Axess dilutes their boldness in the shadow of Maxxess and in an album which hides nice pearls. Pearls of tones, of rhythms and of ambiences, with per moments a P.Peak claw, which seem to me to be sacrificed for the benefit of a six-strings very omnipresent for an album of electronic rock. But not for a Maxxess album.